10-year-old child among dead as thousands of Morsi supporters mark 100 days since a deadly crackdown on sit-ins. Clashes across Egypt on Friday left at least three dead, including one child, reports Al Arabiya. The clashes occurred as thousands of supporters of ousted Islamist President Mohammed Morsi rallied to mark 100 days since a deadly crackdown on Rabaa al-Adawiya and Nahda sit-ins. The 10-year-old boy was killed by gunfire in the city of Suez during clashes between supporters and opponents of Morsi, Al Arabiya reported. He was reportedly hit by a bullet in the back of the head while he was walking with his mother near the site of the clashes. 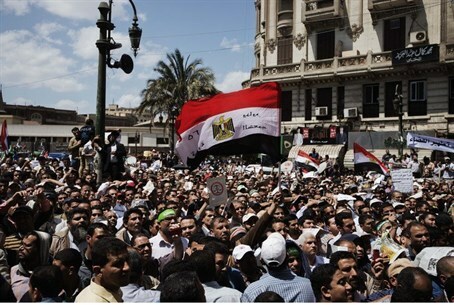 The Friday rallies were called for by the anti-coup coalition known as the National Alliance in Support of Legitimacy. Cairo’s Rabaa al-Adawiya and Nahda squares were sites of a crackdown by security forces on Morsi’s supporters on August 14. Hundreds of people were killed. Last week the Egyptian government lifted a state of emergency that was declared on August 14, the day of the crackdown on the protesters. Several days later, unknown gunmen shot and killed a senior national security officer in Cairo as he headed to his office.